I made a set (Profile, Timeline and tag) with this cute and witchy and Bewitchy themed “JackOWitch” CU Tube. You can get this CU tube at Lil Mz’s Brainstorm’ store. You can also buy this CU bundle at her store AND PFD. I matched it with a gorgeous and spell binding “Halloween Bride” kit. 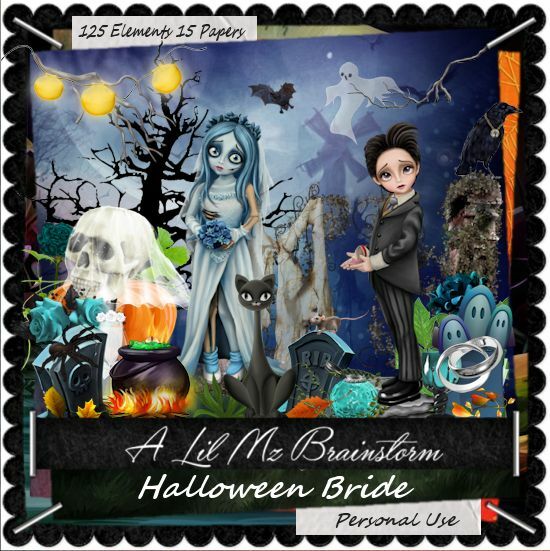 This personal use scrapkit contains 125 gorgeous and at the same time spooky and goth elements and 15 coordinating papers and is sure to add witch and goth themes to your tags. This kit can be bought at Lil Mz’s Brainstorm’ store. You can also find at PFD.